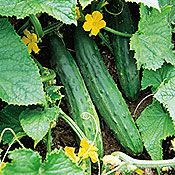 Ideal pickling type for space-saving gardens and containers. 4-5" slightly tapered fruit. Produces both male and female flowers separatley on the same plant.